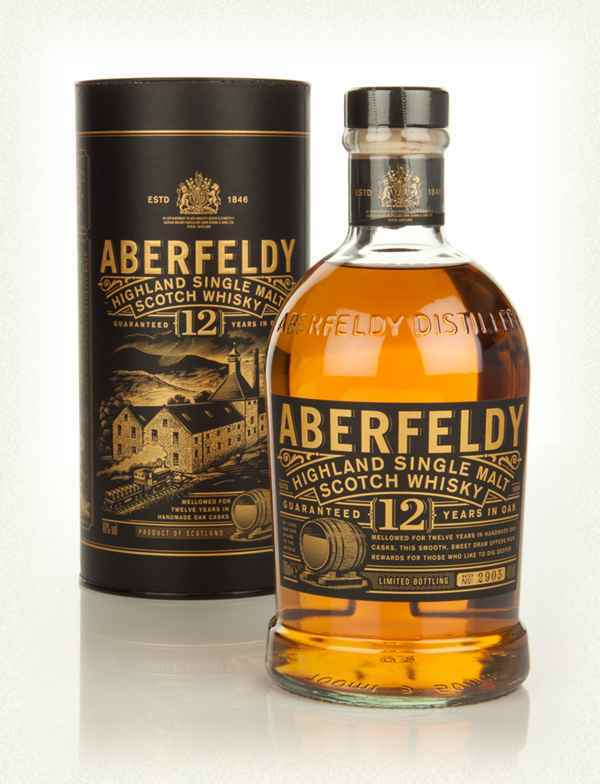 Aberfeldy Distillery was built in 1986 by John Dewar & Sons to supplement their booming blended whisky business. If you visit the distillery (between Perth and Pitlochry) you’ll learn all about the Dewar’s and how they built their whisky empire. These days, Dewars is owned by Bacardi, a powerful rum family. Makes you think of the Godfather. Anyway, along with Aberfeldy, Dewars/Bacardi own Aultmore, Craigellachie, MacDuff, and Royal Brackla. Prior to this year only Aberfeldy and MacDuff were regularly bottled as official single malts. MacDuff is marketed as Glen Deveron. But I guess because of the whisky boom, they have now released the 3 other single malts. The pricing on those however is somewhat astonishing (expensive that is). It’s all in the fashion of this modern gold rush of single malt madness. Well Aberfeldy has the most single malt experience in the lineup and the prices seem to be staying reasonably sane. So let’s see how it fares. Sweet sweet honey, Burt’s Beeswax lip balm. Wet hay. For some reason reminds me of the smell of the Highland Games in Speyside after it rained. Again with the mega honey. Sweet waffles with whipped cream and maple syrup. A bit of this strange cardboard tang or maltiness. Diluted honey and vanilla and whipped cream from a can. Honey comb. Again with the malty cardboard tang. Well if you like honey, I think you’ll like this. It’s smooth and unoffensive. Easy drinking. Not as complex but perhaps something light and nice for new whisky drinkers. Fried bananas, citrus and a fresh can of paint. Quite woody with sweet undertones, mocha latte with cinnamon. Mellow finish that lasts just long enough. Nice light crisp dram. Would have again but not a go-to dram for me.